A choice 7/16x 2 1/4" doubly-terminated Arkansas green and tan chlorite phantom rock crystal you may want to wirewrap to wear right away and study later - light natural etching and a perfect growth crater are incidentally placed just right for your wire! Brass would highlight this quartz anomaly beautifully. 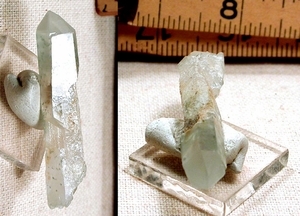 Tan and brown chlorite inclusions help define a tabular, ruffled partial cathedral termination - a nicely defined green chlorite phantom points the way to layered facets at the other end, with white titanium included. Green chlorite is prized for healing work, aided and amplified by quartz...receive and send this good energy, as this crystal is doubly-gifted!